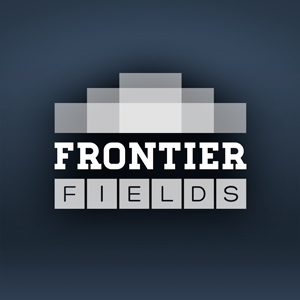 This is the first in a series of posts introducing and providing essential facts about each of the Frontier Fields. Abell 2744, also known as Pandora’s Cluster, is a giant pile-up of four smaller galaxy clusters. Abell 2744, and its neighboring parallel field, are among the first targets of the Frontier Fields program. The Abell catalogue of galaxy clusters was first compiled by astronomer George O. Abell in 1958, with over 2,700 galaxy clusters observable from the Northern Hemisphere. The Abell catalogue was updated in 1989 with galaxy clusters from the Southern Hemisphere. 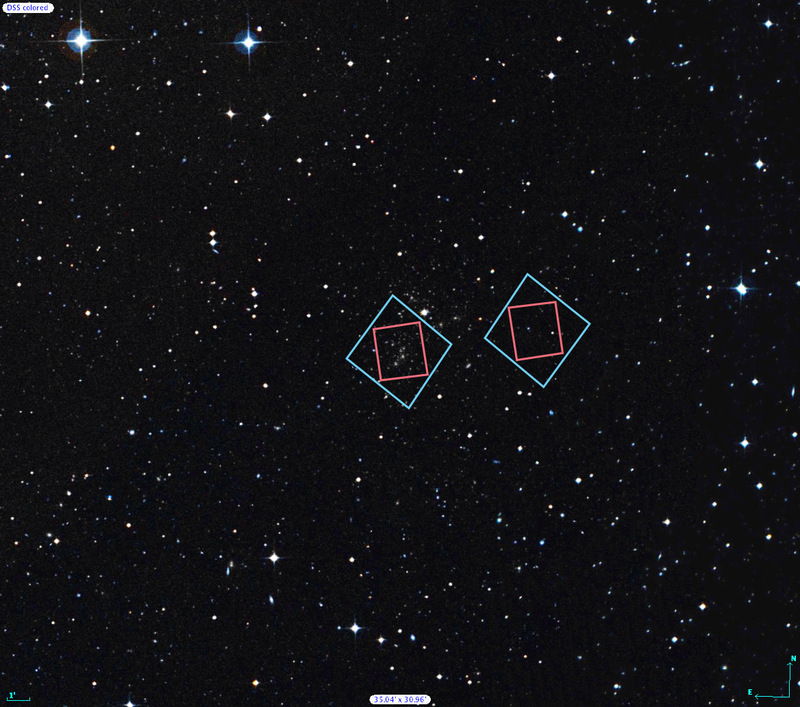 The locations of Hubble’s observations of the Abell 2744 galaxy cluster (left) and the adjacent parallel field (right) are plotted over a Digitized Sky Survey (DSS) image. The blue boxes outline the regions of Hubble’s visible-light observations, and the red boxes indicate areas of Hubble’s infrared-light observations. A scale bar in the lower left corner of the image indicates the size of the image on the sky. The scale bar corresponds to approximately 1/30th the apparent width of the full moon as seen from Earth. Astronomers refer to this unit of measurement as one arcminute, denoted as 1′. Credit: Digitized Sky Survey (STScI/NASA) and Z. Levay (STScI). 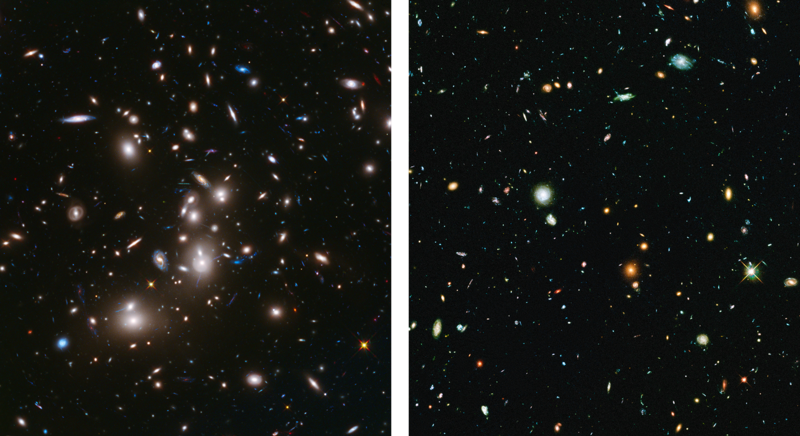 Shown here, with approximately half of the expected data included, are the early Frontier Fields images of Abell 2744 and the associated parallel field. Left: Frontier Fields image of the galaxy cluster Abell 2744 is displayed with colors chosen to highlight the newly obtained infrared data. The infrared-light data are shown in red. Visible-light data are included from archived observations and displayed in blue and green. Right: The new Frontier Fields image of the adjacent parallel field is displayed. In this image, all of the colors represent visible-light data. The planned dates for Hubble observations of the Frontier Fields include observations approximately six months apart. This is the time it takes for the cameras on Hubble to swap positions so that both visible-light data and infrared-light data can be captured from the galaxy cluster field and the adjacent parallel field, as described in this post. Redshift measures the lengthening of a light wave from an object that is moving away from an observer. For example, when a galaxy is traveling away from Earth, its observed wavelength shifts toward the red end of the electromagnetic spectrum. The galaxy cluster’s cosmological redshift refers to a lengthening of a light wave caused by the expansion of the universe. Light waves emitted by a galaxy cluster stretch as they travel through the expanding universe. The greater the redshift, the farther the light has traveled to reach us. Looking for Hubble data used by scientists? Reblogged this on Mad Science Tech. Muchas gracias, saludos desde Roma Cristiana.